Dog Cat Pet Grooming Rubber Red Oval Brush with Adjustable Strap! Packaging may vary. This Pet grooming brush is made out of rubber its ideal for the dead loose hair removal and massaging the skin of your pet. Its strong and durable with a rounded design preventing injuries to pets. Use during bathing to enhance the effectiveness of your shampoo. Distributes natural oils to enhance coat's shine. Made of soft high quality rubber. 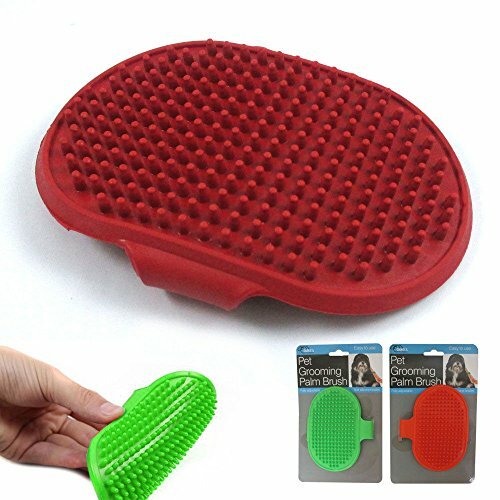 Removes dead loose hair on dogs and cats 5" x 3.5" oval shape. Features: Color: Red or Green. Randomly color shipped. Rounded design prevents injuries to pets. Use it wet or dry. Has and adjustable hand strap. Ideal for grooming and bathing. Removes dead loose hair on dogs and cats. Size: approx 5" x 3.5" oval shape. Easy to clean and disinfect. Removes dead scaly skin. 1 Pet Grooming Brush Available colors: Red and Green. Randomly color shipped.